On Sunday 12th August, Setting Son Records and RDE present The August Showcase – with Lice, The Lizards, The Hungry Ghosts, and Whitelight all playing at the Hare & Hounds. Doors open at 6pm, with advance tickets available for a mere £7 sterling plus a smidgen of a booking fee… which works out at around £1.75 a band, so literally cheaper than chips. Although a small cone of chips are available across the road for £1.25, so literally cheaper than some chips. For direct event information and links to online ticket sales, click here. For the rest Google ‘Charlie’s Chippy Kings Heath’. Lice have been steadily creating that kind of hard earned hype for a couple of years now – burrowing deep into the Bristolian live music circuit, snapping up support slots with The Fall and Fat White Family, then heading out across the UK to open for Idles on a sell out nationwide tour. 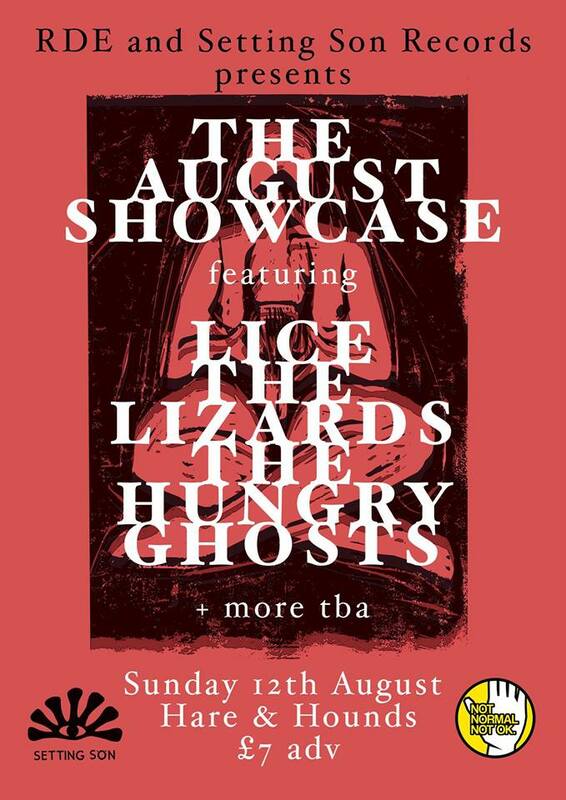 But if you need a more regional reason to drag yourself off the sofa and out the door, then we have three – with The Lizards, The Hungry Ghosts, and Whitelight also playing at The August Showcase. So, sold. Sold. And sold again. All for less than a tenner and a potato based snack, pass the ketchup. Setting Son Records and RDE present The August Showcase – with Lice, The Lizards, The Hungry Ghosts, and Whitelight all playing at the Hare & Hounds on Sunday 12th August. For direct event information and links to online ticket sales, visit the Facebook Event Page by clicking here.